Last week was my daughter’s first birthday and to celebrate properly I felt that I had to make a nice, girly cake, which would be easy enough for a novice in cake decorating like me, but fun enough for adults and kids alike. I also wanted to experiment with sugarpaste, a media I had never used before. 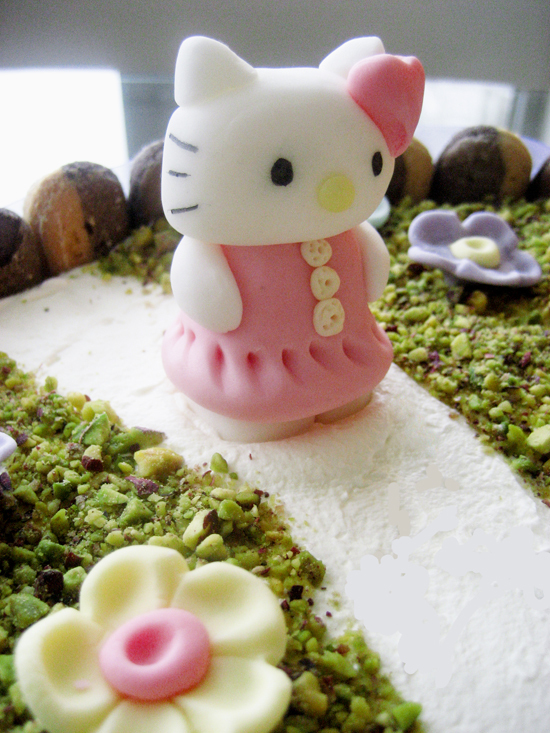 The idea for the cake came from a favourite blog of mine, Αmouses Bouche, and since I was a big Hello Kitty fan when I was little, I thought it would be great to try and make it. In Greece when we say “Birthday Cake” we actually mean something which is not to be left on the kitchen counter, but needs refrigeration, and usually contains a mousse or french butter cream filling sandwiched between two layers of sponge cake and covered with whipped cream or ganache. This tradition makes using sugarpaste almost impossible, as sugar hates humidity, but I thought I could give it a try (ideally I should have used marzipan, but I didn’t) . Since I am not in favour of artificial colours, I loved the fact that in this cake all green came from pistachios, the white was whipped cream and the only artificial colours were used in the sugarpaste, which was not to be eaten. 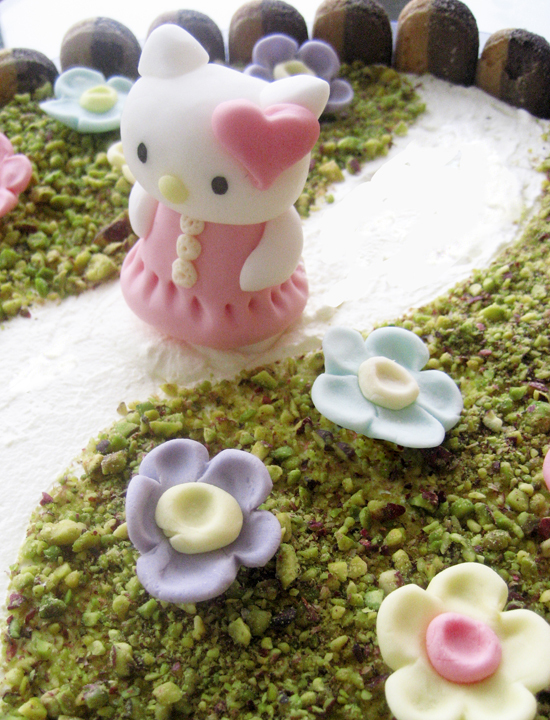 I purchased a Hello Kitty figurine, which I ended up using together with the sugarpaste one and made many flowers which were placed on the cake a bit before serving.Working with sugarpaste is great fun and so very relaxing once you get the hang of it. I used the ready made stuff, as the quantity I needed was very little, but I will be making my own soon. After several attempts with the pink-tinted white chocolate band, I ended up covering the sides with two-toned ladyfingers, an easy and quick way to give your cake some decoration. A tied a lilac ribbon around the ladyfingers, made a bow and I was done! For the filling I made a chocolate sponge, drenched with some diluted (home made) strawberry jam, placed chopped strawberries on it and covered it with chocolate mousse. I then covered the top with unsweetened whipped cream and decorated it the cake. Needless to say that I got many complements for the cake and I was a very proud mama! bravo – you made a wonderfully girly cake! Πρώτα απ’ όλα να σου ζήσει η κορούλα σου! Να είναι χιλιόχρονη και καλόχρονη! Είμαι σίγουρη ότι η τούρτα της θα της έμεινε αλησμόνητη!! I love it Ioanna! I too began my cake decorating endeavors with my daughter’s first birthday cake … I found that first time quite stressful but each time after has gotten easier and easier. Now, I am the dedicated cake-maker among family and friends!! And you are right, working with the sugar paste is quite calming when you’ve given yourself adequate time. Truth be told, you can create anything you can imagine. 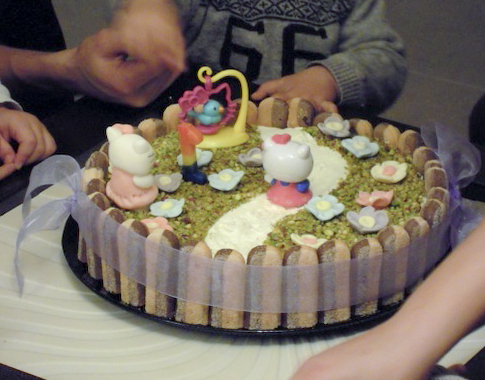 The cake is beautiful Ioanna. Happy birthday to the little one. I feel the same about aritificial colouring and rarely use it. Η μικρή σου θα είναι περήφανη για τη μαμά της οταν αργότερα θα βλέπει τις φωτογραφίες γενεθλίων της! Και πάλι πολύχρονη εύχομαι! Η τούρτα σούπερ, είσαι φοβερή και καταπληκτική ιδέα το φιστίκι Αιγίνης για χρώμα! Πειραματίζομαι κι εγώ με την ζαχαρόπαστα, δική μου όμως με μαρσ μελους. I can’t believe you describe yourself as a novice cake decorator! This looks so professional! A novice cake maker no longer. I am sure this cake was very well received by the birthday girl and the grownups. What a cute little cake! Definitely would have found it hard to cut into that beauty! O wow, is it already one year! Doesn’t time fly? I was going to say that you did a fantastic job making that Hello Kitty doll, but then I read that you purchased that one..lol… You still did an amazing job on your first cake decorating adventure! It looks really professional! Συγχαρητήρια για την πρώτη και πολύ επιτυχημένη όπως φαίνεται, παιδική τουρτο-προσπάθεια! Αναμένουμε τις εξελίξεις με την ζαχαρόπαστα! Καλησπέρα. Σε παρακολουθώ συχνά, αλλά δεν είχα καταλάβει ότι φτιάχνεις τόσο υπέροχα πράγματα με την ζαχαρόπαστα. Είδα την ανάρτηση της Ερμιόνης και έμεινα άφωνη. Παίρνω το θάρρος να σε ρωτήσω για τα γενέθλια της κόρης μου, τα οποία θα γίνουν μάλλον 23.04.16. Θα είμαστε γύρω στα 30 άτομα και θα ήθελα να σε ρωτήσω αν έχεις χρόνο να το αναλάβεις και για το κόστος.